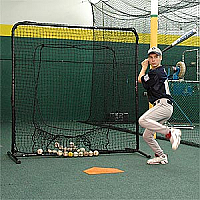 The Catch Net Screen can be used outdoors and indoors. The snap lock pin frame has been powder-coated to maximize the life of the frame. Comes complete, ready to assemble (no tools needed). Just snap the frame together and slip the double net (pillowcase style) over the frame and it's ready to use! Perfect for hardball or softball players, teams, schools or just at home.